I have felt hurt, pain, and isolation for many years, but Life Stream has showed me how to open up, trust others, and speak up. I recently had two close bereavements and I struggled through Christmas and New Year. However, every home group, phone call, or text from Life Stream reminds me of the goodness of God’s love. Due to my health at times, I have not always found getting out of Brighton easy. Retreats have been a turning point, a respite from my past life, and a chance to get close to nature and Jesus. Life Stream is a beacon of light and hope in my life, and has brought me many friends and positive change. I have joined Centre Church where, with my growing faith and increasing confidence, I have helped at the Night Shelter for the homeless. I have shed the old and embraced a new life in Christ. Change has been dramatic, and I can now also see my son becoming more confident in his own life. As I grow it eases the burden on my son to feel he has to take care of me. Life Stream provides an open safe place for women to be able to find friendship, support, healing, and, most important of all, the Love of Christ. What God is doing is truly amazing, but the best is yet to come. Thank you for coming into my rest home, you are such an added bonus. The staff are wonderful, but it is so nice to have people come in and see me. You don’t know my background, but you show interest and genuine love to me, making an effort to come into my life. The days are long for me in the rest home and you bring freshness and new interest into the lounge. Thank you for talking about the Bible and making it real, and for the singing, I love the old hymns because they bring back wonderful memories. I appreciate your visits because I love the Lord, I used to go to church, but now I cannot get out, so I need the church to come to me. Thank you for caring for me and all of the other residents that you visit. Sara, our Food Bank Team Leader, is facing her biggest challenge to date! 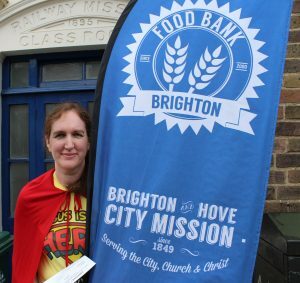 She set herself an unusual challenge for Spring, to get fit, and to raise funds for the Brighton Food Bank, so she signed herself up to the Heroes Run. The Heroes run takes place on Brighton seafront on Sunday 15th May, at 10.40am, and you can choose between the 5K or the 10K route. Sara will openly admit that she isn’t the fittest of people, and that this challenge that she set herself will be hard. She has never, ever, ran in any sort of race like this, let alone a 5K, so she joined a gym and has been training really hard. Sara would absolutely love it if you were to support her in this endeavour, you can support financially by clicking here – https://my.give.net/HeroesrunSara. Sara completed the race in around 38 minutes, which was quicker than she expecting! Well Done SARA! You can still donate towards the cause! At the start of November 2014 I only had £2 a day to live on. I was referred by St Luke’s Advice Service to the Brighton Food Bank. At the time I had little income left to eat or heat my flat. My hours as a part time carer had been reduced, and I had rent arrears and bills to pay. For about a year I got practical help with food and, sometimes, with my electric bills. The Food Bank team also helped me with a letter when I faced eviction from a flat owned by a local landlord. Unfortunately, despite the letter, I lost the flat and became street homeless. So the team then wrote a reference for my new landlord because they believed in me. As a result of their, and another agency’s support, both practically and financially, I was able to move into a lovely new place just before Christmas. emotional support of the team. If I hadn’t come here I wouldn’t have got where I am today. Do you want to freshly inspire your church to think about mission? Do you want to find out about some of the needs in our city and how Christians are responding to them? Why not invite one of the Brighton and Hove City Mission team along to your church to share about the mission work we do in the city? Over the last year we have seen a big change in our staff team, eight of our ten staff members are new since 2014, and large parts of what we do have developed and grown in recent years. Any one of our team would love to come and present the work of the mission at your church, whether it be a prayer meeting, midweek meeting or even a Sunday service. A ten minute presentation – A quick whistle-stop tour of the work we do in the city. A thirty minute presentation – A more detailed presentation containing stats and videos, and could contain a Q and A session if you would like. 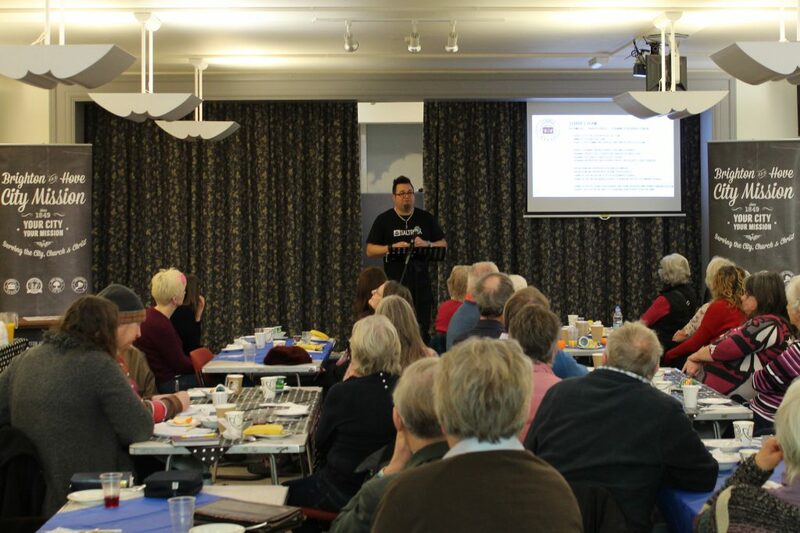 If you would like to book us to come and share at your church, or for any more information regarding speaking engagements, please email: julian@bhcm.org.uk.